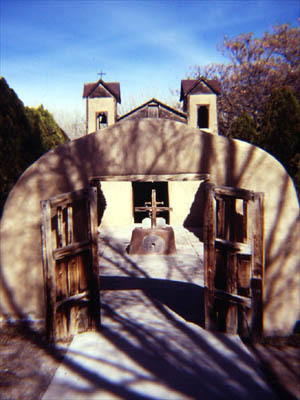 El Santuario de Chimayo was built between 1814 and 1816. It is famed for the small hole in a side room which contains "holy dirt." Numerous cures have been attributed to it. The site became a focus-point in 1810, when Don Bernardo Abeyta, a local "Penitente" (member of a flagellant sect) saw a light shining out of the ground. (It was Good Friday night, and he was out performing "penances" nearby.) Approaching the light, he dug down on the spot until he found a crucifix. Other locals came to witness the miracle, and the priest in nearby Santa Cruz was summoned. He took the crucifix (in procession, of course) back to his church, where it was placed on the main altar. The next morning, it was gone, having returned during the night to Chimayo. A second and third time the crucifix was removed and returned, until it became clear that the "Lord of Esquipulas" wished to remain where he had been found, so a small chapel was built; the one we see today was an enlarged version built just a few years later. As for the healing dirt: People rub it on ailing parts of their body, or mix it in water and drink it. There is an anteroom filled with canes, crutches, and written testimony of healings. As the earth is taken away constantly (statistics indicate 300,000 visitors a year at the Santuario), the hole is frequently and unabashedly replenished from a pile of "blessed" earth outside the building. No one seems to mind. If you know me, ask me sometime about how my father was "healed" at Chimayo (and my mother and I almost died--laughing--as a result).